We are one of the prime Calamus Essential Oil Exporters from India. Calamus Essential Oilis extracted from the root of plant Acorus Calamus. It is yellowish brown oil soluble in alcohols and other essential oils and insoluble in water. It is used as general tonic for the brain as well as nervous system. 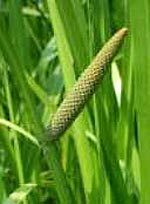 Calamus Essential Oil in useful in symptoms of head like neuralgia, epilepsy, memory loss, and shock.